(Francisco Kjolseth | The Salt Lake Tribune) BYU head coach Kalani Sitake gathers his team during the first half of the NCAA college football game, Saturday, Sept. 8, 2018, at LaVell Edwards stadium in Provo, Utah. Provo • Five weeks after BYU woke up in the second half and demolished Western Michigan 49-18 in the Famous Idaho Potato Bowl to finish coach Kalani Sitake’s third season with a 7-6 record, the Cougars’ coaching staff is hard at work recruiting for national signing day on Feb. 6. It has been a relatively quiet offseason — a year after a tumultuous December of 2017 in which the majority of the offensive coaches were released and replaced — but one in which a major question hangs in the air regarding Sitake’s future. Why hasn’t the school extended Sitake’s contract? The five-year deal he signed when he was hired in December of 2015 expires after the 2020 season. Now seems like a good time, with the program seemingly on the upswing, coaches on the recruiting trail daily and another killer September schedule on the horizon that includes Utah, Tennessee, USC and Washington. Coaches typically get contract extensions when two years remain on their contracts. BYU is a private institution and does not have to divulge terms of its coaching contracts like public schools do, but an athletic department spokesperson told The Salt Lake Tribune on Friday that Sitake is not entering the final year of his contract, contrary to what has been widely reported. Through an intermediary, athletic director Tom Holmoe said Sitake is currently under contract and has more than one year remaining on it, but would offer no other details. 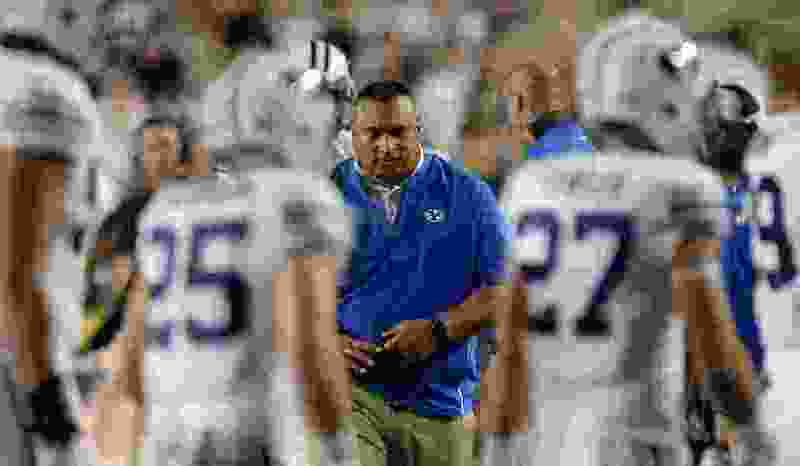 The Tribune requested an interview with Sitake for this article through the BYU sports information department and was asked to submit questions beforehand. Sitake then answered four of the six series of questions via email, but did not address a specific question regarding his contract situation. Certainly, Sitake, who is 20-19 overall, won’t be let go before the 2019 season starts. That would have happened weeks ago if school administrators were not satisfied with the program’s progress after the Cougars seemingly bottomed out in 2017 with a 4-9 record that led to the dismissal of legendary former BYU quarterback Ty Detmer as offensive coordinator. The recruiting cycle is more than half over — BYU signed 14 prospects on Dec. 19, two days before the big bowl win — and Sitake has only a handful of scholarships left to give out on the first Wednesday in February. But it is still important to send a message to recruits that BYU is committed to its coach. For instance, the Cougars especially need help at running back, after rising senior and bowl game star Riley Burt announced he is leaving the program as a graduate transfer. They are in the running for some talented high school and junior college RBs who might have second thoughts signing with a school with an uncertain coaching future. Perhaps the school is waiting until June’s Football Media Day to announce an extension. Bronco Mendenhall replaced Gary Crowton in 2005 and received a three-year contract extension in July of 2011 that would take him through the 2013 season. In June of 2013, however, as Mendenhall was approaching the final year of that agreement, his contract was extended through the 2016 season. Mendenhall had a 74-29 record at the time of that 2013 extension. He left for Virginia after the 2015 regular season, but stayed to coach the Cougars in the Las Vegas Bowl, a 35-28 loss to rival Utah. Holmoe has mostly remained silent regarding Sitake’s job status, and rarely grants one-on-one interviews, preferring instead to hold “roundtable discussions” with media members once or twice a year. He will likely have one of those within a week. Asked for his assessment of the 2018 season in which the Cougars pulled off upsets at Arizona and Wisconsin as double-digit underdogs but lost badly to Washington and Utah State and gave up a 27-7 lead to Utah in an eventual 35-27 loss, Sitake said it was a qualified success. Sitake said progress was made in player execution, fundamentals such as tackling and blocking, and performance in the weight room. Coaches developed their skills in making game plans and in-game adjustments, he said. Sitake has one coaching position to fill after offensive line coach Ryan Pugh left to become the offensive coordinator at Troy. He said he’s in the middle of recruiting right now and not in a huge hurry to find a replacement for Pugh. It also helps that Grimes has “expertise and experience” coaching offensive linemen and can handle those duties until a decision is made.